above is a sample of the interior pages of my Mini Hot Cakes book, which i still have a few available for $10. so for just $10 (plus $5 for shipping anywhere in the US/Canada), u get 28 color pages of pin-ups, sketchcards, and commission sketches, a free headsketch of any character on the back, and a free 13x20 signed print of ur choice! can't beat that! 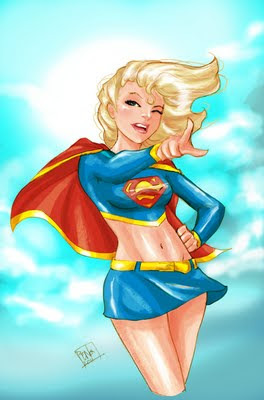 and just for show, this was my July Supergirl:Last Daughter of Krypton Radio Show episode #51 cover for PendantAudio.com. SDCC really caught me by surprise when it was finally upon me and i just had no time to draw something cool for the month. so i had to do an all-encompassing Supergirl drawing in record time, for me. the hubby and i had the pleasure of meeting one of the main folks at PendantAudio.com, Jeffrey Bridges, and his lovely family at SDCC. they're quite swell people!